For each case students had to write a case memo. A case memo is where you have to describe what the crime was, where it took place and the details of the crime. The most difficult thing about the case memo would have to be how to start the case memo. After it started getting easier. I think the reason it was difficult at first is because I didn't really understand my case that much and I wasn't finished reading the case. 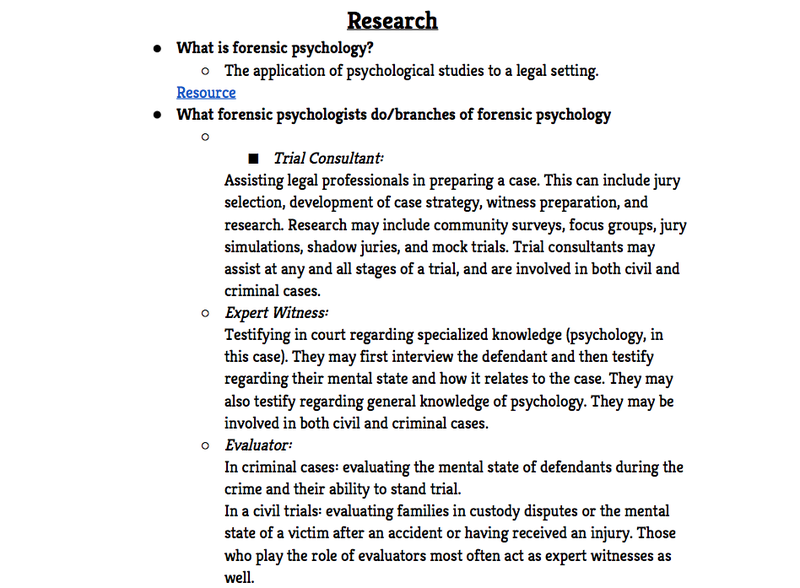 One thing that was difficult when creating the case memo was making it professional. I had to go on google and look for synonyms for a specific word to make the sentence more professional. I contributed mainly in switching words to professional words. It took a lot of time but it was worth it. I did the editing on case memo. The presentation that we had to give out was better than I thought. The only thing that really through me off were the questions at the end of the presentation. We were doing so good until my group mentioned the gun. On a scale of 1-4 I would rank a 3, because we did great but if we would of done more researching I think that it could be a 4. The questions at the end was what was more nerve reacking. I was positive that my group was going to do great. For my individual ranking I would say I would be a 3 too because I did have times I wasn't getting work done. But when I did I worked all day and was focused. I was really proud of my group members. We had one lowlight that probably no group would like to have and that was that we got switched cases. Which was horrible and we didn't have much time to do a better job.